Push/pull is a concept that has been a standard in weight training programs for decades. Doing press type work (bench, dips, overhead, etc.) one day and then pulling the next (deadlifts, rows, chins etc.) is popular with trainers and athletes alike. But I’m going to discuss two very different types of pushes/pulls: the drag and push sled. These pieces of equipment often bring a look of dread to many a strongman’s face. They cause immediate discomfort, nausea, and high heart rates; hence they are avoided to the absolute last minute in most programs. I will show you how this is a huge mistake and how adding them to your programming year round will make you stronger, mentally and physically. 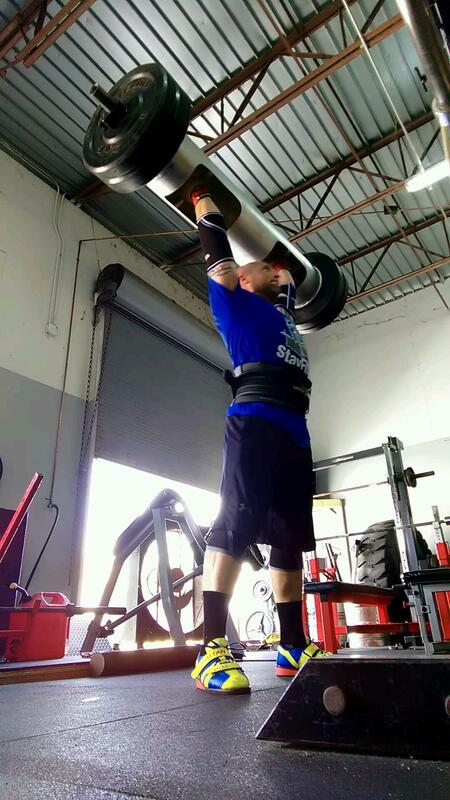 Every strongman competitor is aware of the anaerobic demands of the sport. The time for most maximum repetition and distance events is 60 to 75 seconds. This is smack dab in the wheelhouse of 30 to 120 seconds where the body uses ATP, Creatine (and other) Phosphates, and glucose due to the inability of oxygen to fuel the muscle. The heart rate rapidly increases to 90% or above and lactate (often called lactic acid) is released causing a burning sensation in the muscles. When it pools in the stomach, nausea can stop an athlete dead in their tracks. The best way to train this energy system is via the events and using the sleds. There are great benefits to both, so let’s quickly discuss the pros and cons of constant event training. By training the movements used in contests for time, you can become directly better at them. There truly is no way to get a feel for high rep tire flips, log press, keg runs etc. than by incorporating them into your training. The exercises themselves will make you bigger, faster, and stronger but have a high cost. These put a tremendous stress load on the body due to the weight resting on the athlete or being placed over the center of gravity. Also, most muscle damage that causes soreness occurs mostly with eccentric contractions (lowering portion of the weight). When doing these heavy-weighted motion based exercises, there is almost always a part of the body that is doing some sort of eccentric contraction under load. Additionally, these movements create physical damage to the body including bruising and skin tearing. This alone can set your training back. Now, please don’t get me wrong; I love these exercises and incorporate them into my programming. You must train these movements and intelligent implementation provides benefits in mental and physical toughness. But I am always judicious in their use and observe the athlete for signs of too much damage to their CNS or person. This has to be determined on a case by case basis, and needs the eye of an experienced coach. Enter the drag sled and push sled (often referred to as the Prowler or Dog Sled). These implements can be used to condition the anaerobic system much like training the events, but greatly reduce or even avoid some of the damage they cause. This can lead to a better conditioned athlete allowing them to be faster, stronger, tougher and healthier more quickly over a long period of time. By using a sled to improve conditioning you can control a large number of variables easily. 1. Weight can be super heavy or light and infinitely adjustable. This allows you to avoid failure and work in precise time intervals to increase specificity of your goal. 2. The hands are on uprights, handles, or a bar. The weight is not contacting the body and you aren’t tearing skin or getting bruised. 3. The eccentric contraction is reduced or nearly eliminated allowing you to train the energy system with minimal soreness. 4. Dynamic power can be increased and strength gained primarily in the legs by using short heavy sprint starts. This makes a great substitute or compliment to leg sessions that are focused on power. 6. A well conditioned athlete will recover better between events. This is especially important with a difficult medley in the middle of a contest. I’ve seen super strong athletes suffer during a tough keg run/chain drag and not perform close to their best even hours later. 7. Your mental toughness and ability to suffer will increase during high output sessions. Now you still need to train the events, but they do not have to be your primary means of conditioning. This complimentary style of work should allow better performance on those events in which you are already strong and technically sound. It’s not surprising to see an athlete work the sled for a month suddenly hit two more reps on the log clean and press. The strength was in them all along, but their energy system could not supply the muscles’ demand. To maximize effectiveness of the activities, you should work them into your training on a year round basis. Start by adding a few sessions a week. The best part here is that you have so many options. One day execute heavy pushes for 30 feet and then a few days later perform a lighter 90 second drag. Creating a back and forth medley will really tax you physically and mentally. As you stay dedicated to these accessory movements you will easily feel better on your main movements during the week. A special consideration here (based on volume of work performed) is the need to possibly enhance your recovery process. You may get leaner doing this work and that may not necessarily be your goal. Initially you may need to slightly increase your calories to offset the energy burn here. If you increase the volume of the the work over time, you should slowly be able to adapt without much worry. As the sport becomes more sophisticated, so does the level of athletic performance and demands on the athlete. You will benefit greatly by becoming a well conditioned machine and will see an increase on overall performance. Embrace the discomfort and reap the rewards! Michael Gill can be reached for additional coaching at michaelgill100 [at] gmail.com. Add him on Facebook and Twitter, Instagram and Snapchat @prostrongman.